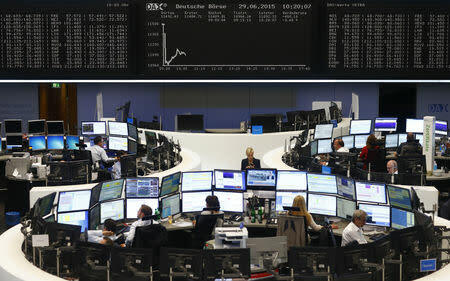 LONDON (Reuters) - European shares traded slightly higher on Thursday as a flurry of corporate trading updates quelled fears of fast-rising U.S. interest rates amid ongoing concerns the Sino-U.S. trade conflict could escalate and hurt the global economy. At 0837 GMT, the pan-European STOXX 600 <.STOXX> benchmark index was up 0.3 percent with bourses across the continent in positive territory. "European markets have opened mixed this morning, shrugging off a disappointing session in Asia, where the reaction to last nights Fed minutes was anything but positive," said Michael Hewson, chief market analyst at CMC Markets. Minutes from a recent meeting showed Federal Reserve policymakers are largely united on the need to raise borrowing costs further despite President Donald Trump's view that interest rate hikes have already gone too far. Meanwhile, Europe's third-quarter earnings season is kicking up a gear after indexes hit a 22-month low last week when jitters over rising U.S. bond yields and geopolitical worries rattled global markets. French supermarket operator Carrefour <CARR.PA> was the top gainer in early trading, up 7.5 percent as sales acceleration in France and Brazil overshadowed weakness in Southern Europe. Media <.SXMP> was the best performing sector, up 1.7 percent, lifted by France's Publicis <PUBP.PA> which regained some footing in the third-quarter and jumped 6.5 percent. The telecom sector <.SXKP> was also well in the black, up 1.1 percent with Sweden's Tele2 <TEL2b.ST>, lifting its guidance after better-than-expected results and rising 5.7 percent. Novartis <NOVN.S> rose 2.1 percent after announcing it would acquire U.S.-based cancer drugmaker Endocyte <ECYT.O> for $2.1 billion in cash as the Swiss drugmaker expands its radiopharmaceuticals business. Some updates disappointed however and HeidelbergCement <HEIG.DE>, one of the world's largest cement makers, fell close to 10 percent as it trimmed its profit guidance for 2018, citing bad weather in the United States and higher-than-expected energy cost inflation. Other European cement makers suffered with Buzzi Unicem <BZU.MI> falling 5.9 percent, LafargeHolcim <LHN.S> 4.3 percent and CRH <CRH.I> down 4.2 percent.